In partnership with Germany’s largest tour operator for winter sport holidays we offer great deals on over 1,200 hotels and apartments. Need to know more about our ski holidays? You can find the answers to the most frequently asked questions regarding your ski holiday by clicking the link below. Unbeatable prices without the need to compromise on quality. 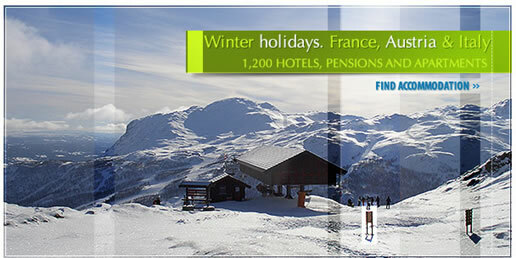 Ski resort accommodation with six day lift pass from only £82 (€102) per person, based on 4 sharing. Our ski holiday bookings are handled by a leading German based travel company, Travel-Trex Reisen GmbH. Founded in 1999 in Cologne Germany, the company employs over 60 people and arranges holidays for over 100,000 customers around the world. When you book ski accommodation online with us, you are booking directly with the tour operator and saving money. Travel-Trex Reisen are a fully bonded tour operator. The bond is in the form of insolvency insurance provided by Reisegarant and underwritten by AachenMünchener Versicherung AG. Every customer who books a ski holiday will receive a "Certificate of Security" as a confirmation that their payment is secure. Trusted Shops is the first award for online shops to offer a money-back guarantee - and this is guaranteed by the insurer Atradius Versicherungsgruppe. Members of the DRV, Germany's largest association of travel agents and tour operators. What is included/not included in the quoted rates. The accommodation and lift pass for our guests are included in the quoted rates. Flight and transfers are not normally included but can be arranged from some departure airports if requested. In most resorts there is a selection of different accommodation types and categories to choose from. Ski lessons and equipment hire can generally be ordered online during the booking process as extras. Support is offered by a central holiday rep.
All holidays include a 6 days lift pass - unless specified otherwise -, valid from Sunday to Friday. The regular 6 days lift pass can be extended to include the day of departure. Due to technical reasons an extension to 7 days is only possible for the day of departure. If you like to have an extra skiing day on the day of arrival, you may purchase a half-day or full day lift pass at the lift station on location. Some destinations offer as an extension a “large“ lift pass which allows you to ski in the whole area. When you book your travel requirements separately (rather that as a package) you can save a considerable amount of money. It does take more time and there are some downsides - but savings usually make the effort worthwhile and you have far more flexibility in your travel dates, there's a huge range of accommodation and destinations, you pick the holiday extras required depending on your needs - etc etc. And you don’t pay any fees and don't pay the charges normally associated with agents. Book your own low cost flights! Most of the accommodation and resorts we list are priced without flights/ferries. This allows you to purchase low cost flights from one of the many flight operators available. Alternatively we list our recommended carriers for your convenience.